Based on the unique concept inspired by the Marine Chronometer instruments designed for long-haul vessels in the 19th century, the Swiss-based brand Ulysse Nardin, which has its own fan base, was the guest of our Hands On corner with its Ulysse Nardin Lady Marine Chronometer Ref. 1182-160C-3C/490 model. Although the watch world is still monopolized by men, it’s a fact that the women’s collections are getting more important than ever especially for the past ten years. 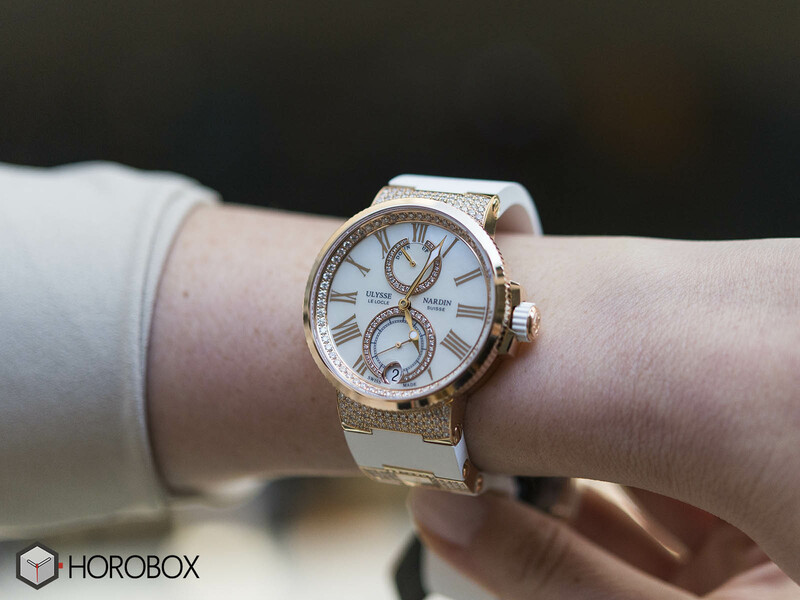 Brands, which show off with their latest ladies collections at the major organizations of the industry like SIHH and Baselworld, are doing their utmost to have a share of that fast growing market. 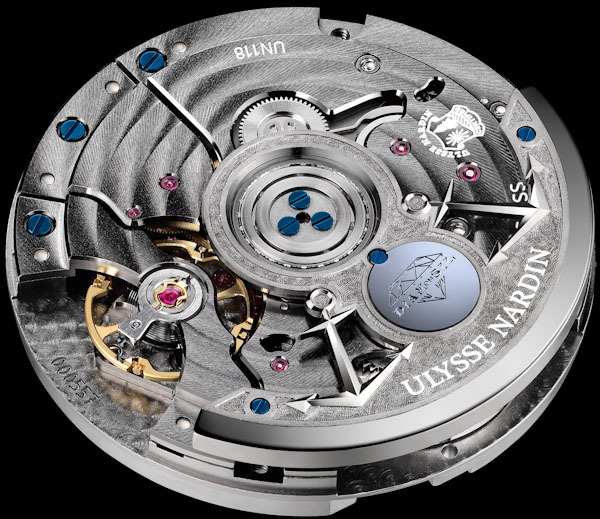 Ulysse Nardin, who has a unique place among luxury watchmakers, is confronted as one of the most enthusiastic brands in women's watches. The famous brand, which started manufacturing Marine Chronometer instruments for ships in the 19th century, continues with a wide product line reinterpreting the cult designs today. The collection hosts amazing women’s timepieces and Lady Marine Chronometer Ref. 1182-160C-3C/490 is one of the best models in terms of blending the concept’s free and sporty spirit with an 18K pink gold case and diamonds. The model is offered in an 18K (5N) pink gold case designed in classic Marine Chronometer style. The case measures 39mm in diameter, which can be considered a pretty big size for a women’s timepiece even in today’s standards, and bears a fully mirror polished finish. The hefty winding crown that we are familiar from the other versions in the collection is decorated with a white rubberized ring. 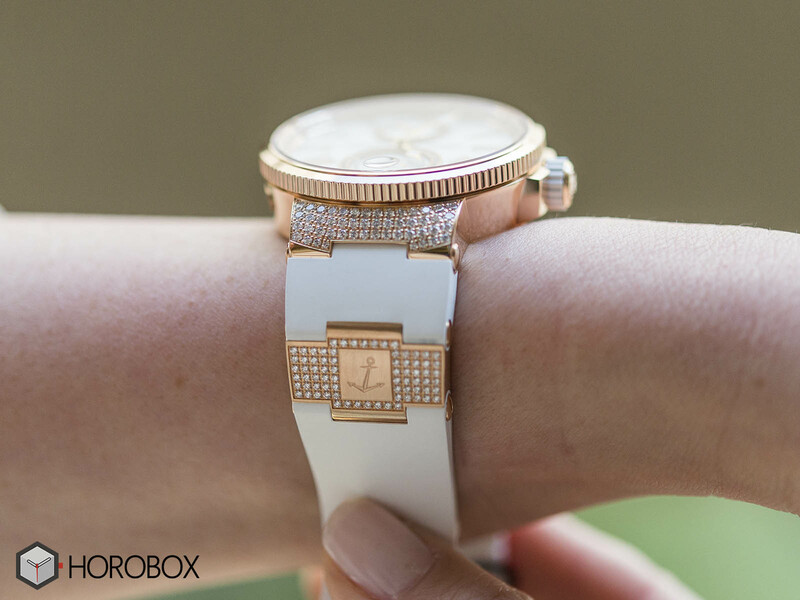 The case, which is water resistant to 100 meters that is quite efficient for daily use, comes with diamond settings which perfectly match with the pink gold and white tones. 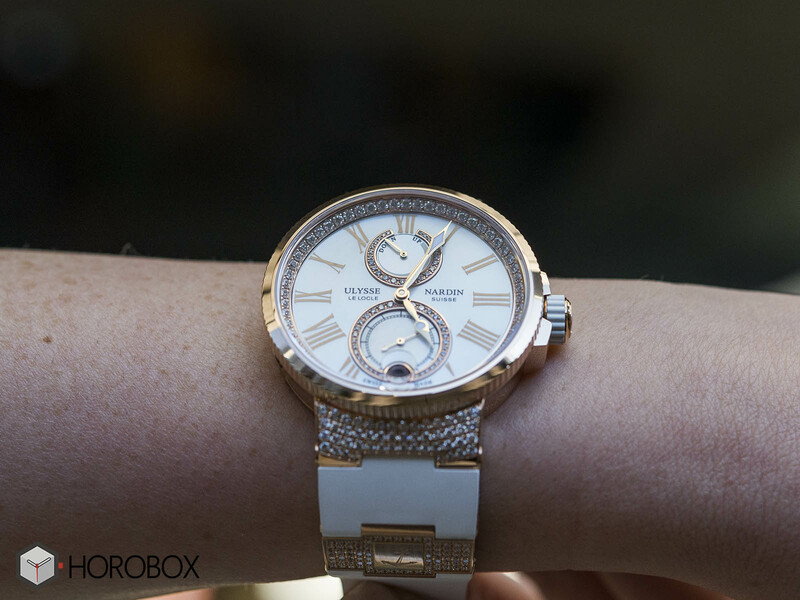 Thanks to its unique lug design which provides large areas suitable for gem setting, the case sports 160 pieces of diamonds including the ones attached to the inner chapter. Both sides of the case are covered with AR coated scratch resistant sapphire crystals. The dial, designed in accordance with the typical Marine Chronometer concept, is made of white mother of pearl. Accompanied by pink gold hands and indices, the dial features a pair of sub counters assigned for power reserve and small second functions. The date display is located within the sub-dial at 6 o’clock. Both sub-dials are decorated with gem-set chapter rings employing 57 pieces of diamonds. The model is powered by the brand’s in-house Caliber Ref. UN-118. Self-winding movement beats at 28800vph and offers a 60 hours power reserve when fully wound. C.O.S.C. certified movement is known as the very first caliber of the brand featuring the DIAMonSIL escapement system. The movement, which also includes the silicon hairspring upgrade to avoid accuracy problems caused by heat changes, can be enjoyed through the sapphire crystal display caseback. Ulysse Nardin Lady Marine Chronometer Ref. 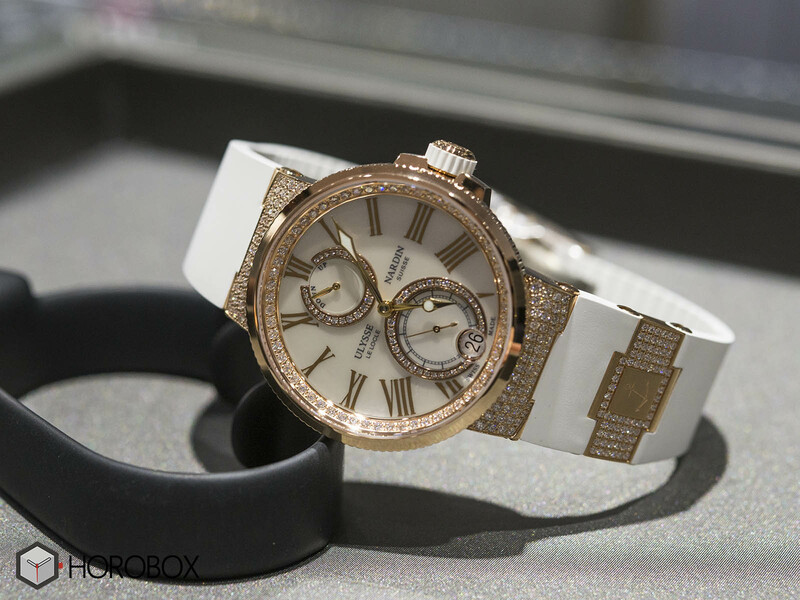 1182-160C-3C/490 comes on the brand’s iconic four piece rubber strap finished in white with gem-set 18K pink gold links. The links, which expose the brand’s logo, features 74 pieces of diamonds. The brand that managed to adapt the Marine Chronometer concept to a women’s timepiece without losing its DNA, wins our utmost appreciation with this spectacular model.